Enjoy all of the comforts and conveniences of home right in the heart of Downtown Mystic, now one of the top destinations in New England. 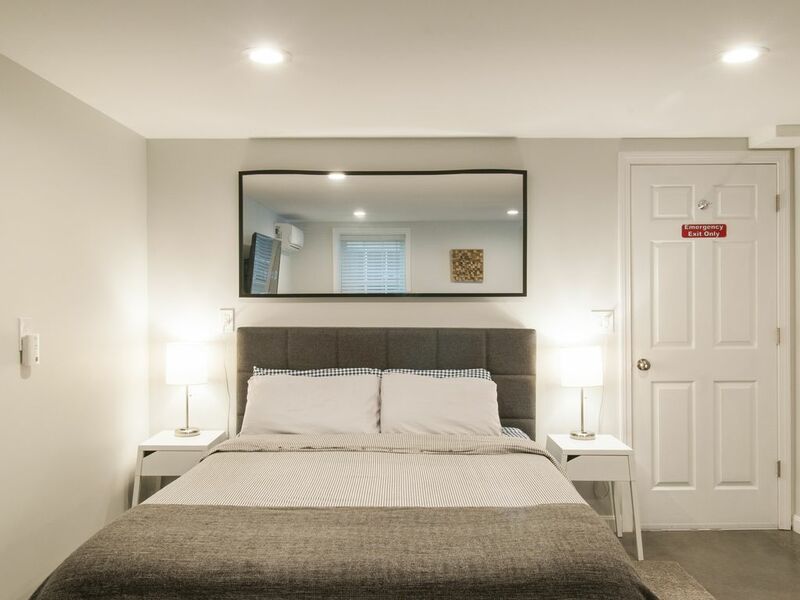 This brand new, modern and cozy basement studio is situated on Water Street right across from the Mystic River. Explore the most popular landmarks, shops and restaurants of Downtown Mystic without the need for a car (but a free off-street parking space is included)! Everything is just steps away. This rental includes a queen-size bed with memory foam mattress, a convertible full-size sleeper sofa, kitchenette with full size fridge, microwave and dishwasher (convection toaster oven, electric kettle and hot plate also available for cooking) a high-top kitchen table / work space and a spacious bathroom complete with front-load washer and dryer. Located on Water Street in Downtown Mystic. Walking distance to over a dozen restaurants, bars and cafes, the historic Mystic Drawbridge, local merchant shop, riverfront parks and the Mystic Seaport. One off-street parking space included in rental. Additional free on-street parking is available in the immediate area. Just the right size for one or a couple. Location can't be beat, a very short walk to everything. Rental included everything I could possibly have needed. Clean and cozy, nice comfy bed. The parking situation can be tricky to do the first time after dark but it was great having a designated parking area in Downtown. Good walking proxemity to both evening drinks in one direction and morning coffee in the other. Studio apartment was clean an comfortable. We enjoyed our stay in Mystic very much. The apartment was perfect for our needs. Convient to downtown and easy access to local hotspots. Really liked the parking lot across from the studio apt. Would stay here again on a future visit! Perfect for a weekend stay. Nice studio apartment steps from the heart of Mystic. Parking was great. It was perfect for my weekend stay! Cute and close to everything Mystic! Small but for the amount of time I spent in the room, it was perfect! While my stay was quick and didn’t require much communication with the host, he was very thorough in his emails. Definitely will stay again!